The U.S. Army says it has launched an investigation into the disappearance of “sensitive” equipment at a military base near Fort Lewis, Washington. The military has not said exactly what that “sensitive” equipment that has been stolen from Joint Base Lewis-McChord is. A 100-member infantry company has been put on lockdown at the joint Army and Air Force base while the investigation is conducted, reports the Associated Press. The base has been a focal point for the challenges service-members face when returning home from multiple — often traumatic — deployments. 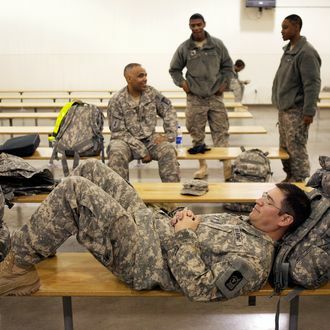 A recent Los Angeles Times profile of the Fort Lewis area detailed how suicides, murders, fights, robberies, domestic violence, drunk driving, and drug overdoses have all increased around the base as veterans have returned from Iraq and Afghanistan. “The local crime wave became apparent as early as 2004, when three elite Army Rangers were among a group of five men who stormed into a Bank of America in Tacoma armed with AK-47s, took over the branch and walked out with $54,011. Benjamin Colton Barnes, the Iraq war veteran who shot and killed a park ranger before drowning in a creek on Mount Rainier last week, was stationed at Lewis-McChord. Base officials are reportedly offering a $10,000 reward for the return of the equipment.